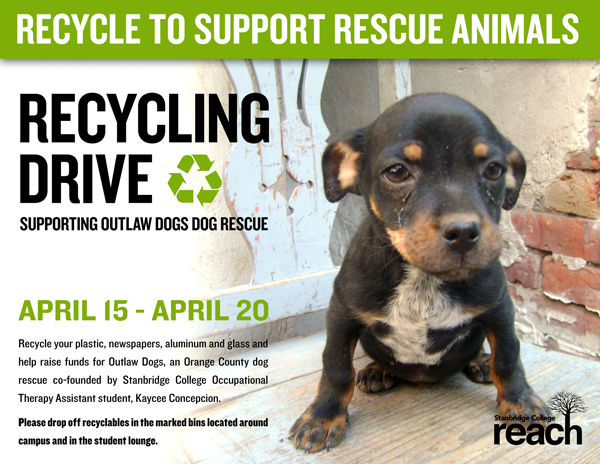 Stanbridge College REACH – Beyond the Classroom™ asks you to participate in the Recycling Drive for Outlaw Dogs, an Orange County dog rescue co-founded by Kaycee Concepcion, Stanbridge College Occupational Therapy Assistant student. Starting Monday, April 15th recycle your plastic, glass, paper and aluminum to give homeless, neglected and abused dogs a better chance at finding the support they need. Outlaw Dogs is a dedicated to rescuing animals from situations that are abusive, endangering or neglectful. They provide services for finding new foster homes, permanent adoptive homes and veterinary care for unwanted or homeless dogs. Outlaw Dogs also promotes the importance of spaying/neutering companion animals and how to prevent animal cruelty. Location: Stanbridge College Campus & Student Lounge – Please drop off recyclables in the marked bins located around campus and in the student lounge. For more information about Outlaw Dogs, please visit them on Facebook at www.facebook.com/outlawdogs.